At the Allied Forces Victory Parade in 1945 US and British observers were stunned at the appearance of 52 low, powerful new Soviet tanks rumbling across the streets of Berlin. These tanks, the new IS-3 heavy tank, were a big shock and even with new US tanks like the T26E3 Pershing and British Centurion Mk. I going into service, it was obvious in the minds of the observers they were going to run up against a totally new generation of threat. What was not really known until the 1990s was the fact that the IS-3 was a mechanical nightmare and not even fully functional until the final IS-3M rebuilds of the 1960s. Those 52 tanks were the limits of production at the time and were barely able to cross the review area without breaking down. But the seed was sewn, and so both US and British designers began to search for a countermeasure. Using the basic design of the prototype T48 medium tank, US designers soon developed heavy tanks designs but it was not until 1950 that the even larger T43 heavy tank with a four man turret and an 810 HP air-cooled Continental gasoline engine. This mounted a massive 120mm gun using separate loading ammunition, which is why it needed a four man turret crew - commander, gunner, projectile loader and charge loader. The T43 had a number of problems and evolved into the T43E1 model. Even while under test it was accepted for service, and the first 80 tanks of an eventual 300 were built and provided to the Army as T43E1s. Now designated as the M103 Heavy Tank, due to continual problems and bugs the new tanks were instead sent to Fort Hood while development continued. The next modification, the T43E2 or what became the M103A1, added a number of essential features such as a turret basket, a stereoscopic rangefinder, and a ballistic computer as well as a new direct fire sight for the gunner and periscope (the main external differentiation). But while the Army was lukewarm about the tank, the USMC was not happy at all even though they had ordered 220 of the tanks. But as the Army needed them the odd situation arose of the Army having to borrow back 72 A1s and send them to Germany to form two battalions of tanks and replace their M103s with the newer tanks. Alas, the tanks still suffered from very poor range - 80 miles highway on 268 gallons of internal fuel, and so like the M48s then in service had to mount a droppable rack at the rear of the tank for four 55 gallon drums to nearly double that range. By 1961 technology had caught up with the M103A1 and the M60 with its new gun firing HEAT and APDS ammunition could achieve better penetration than the brute force 120mm gun. Even so, as the USMC had 219 of the tanks on hand, they followed the US Army upgrade problem that created the M48A3 and also the M103A2. Both of these tanks used a new Continental AVDS-1790 diesel engine which greatly increased performance and range. While the Marine Corps wound up with 218 of its 219 thus converted, due to the technology changes noted they were relegated to the reserves until retired. 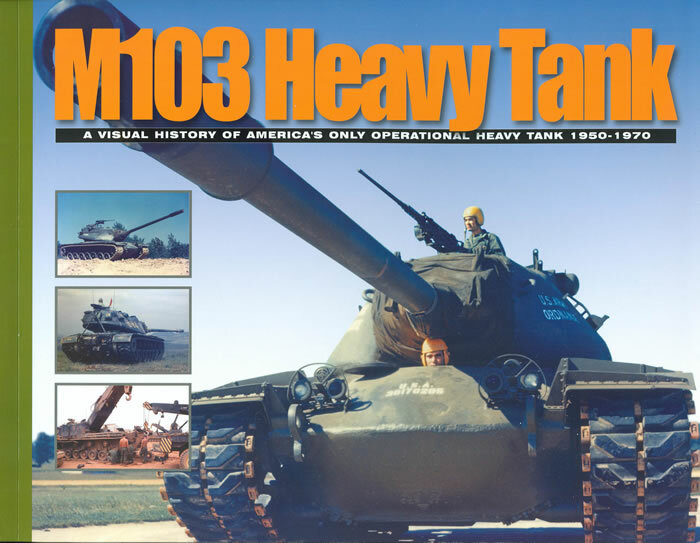 This book provides a wealth of detail and service shots of all of the tanks from T43 to M103A2 as well as a short section on the “Ox” – the M51 Heavy Tank Retriever. 187 of these vehicles were built as the then standard M74 tank retriever on the M4A3 chassis was not capable of recovering the M103 series. They were popular and even while never upgraded with the diesel had long careers, as they were used to recover the M103, the M53 and M55 self-propelled guns, and any other vehicle in either the Army or Marine Corps inventory. Anyone with the DML M103A1 or M103A2 kits should pick up this book as it is invaluable for both correcting their errors and adding missing details. Overall this is another great job from Mr. Doyle and Ampersand.